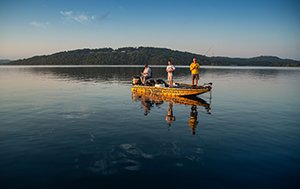 There are plenty of big bass to be caught at Table Rock Lake in Branson, one of the key reasons major tournaments such as the B.A.S.S. Bassmaster Elite Series and Fishing League Worldwide (FLW), have hosted tournaments there. And while you certainly don’t have to be a pro to have a great outing, you can land ’em like one on your next fishing trip to Branson. A five-pound, 10-ounce hybrid black bass. A seven-pound, eight-ounce spotted bass. A five-pound, six-ounce white bass. With more than two dozen boat ramps at Table Rock Lake, plus points of entry at private resorts, finding access to the water – and spots where lunkers live – is easy. A popular spot from which to access the lake – for regular anglers and tourney pros alike – is State Park Marina. In addition to offering a spot to put-in, the Marina has bait, tackle and fishing maps, plus snacks, drinks and those things you sometimes forget, like sunscreen. The Moonshine Beach Access is conveniently located less than 10 minutes from Highway 76 and attractions such as The Titanic Museum, or make a side trip to the Copper Run Distillery for a taste of locally distilled spirits. These are just two of the places to access Table Rock Lake. The Army Corps of Engineers maintains an updated list of access points and marinas on its website, in case your travels don’t lead you to either of these locations. Oh, and in case you’re wondering, Bull Shoals Lake in the Branson area also is home to some impressive fish. According to the Missouri Department of Conservation, a 13-pound, 14-ounce monster caught at Bull Shoals is the state’s record largemouth, while the state’s record striped bass is a 60-pound, nine-ounce behemoth caught near Powersite Dam, near Forsyth. And that’s no fish story. Start planning your next fishing trip – one that leads to a brag-worthy fishing story – today! You can find some great cabins on Table Rock Lake to stay in during your visit, and download a map of Table Rock Lake to help you plan.